As of 1 January 2018, 22 out of the 28 Member States of the European Union (EU) have national minimum wages: only Denmark, Italy, Cyprus, Austria, Finland and Sweden do not have any. The 22 EU Member States that have national minimum wages can be divided into three main groups based on the level in euro. In January 2018, Bulgaria had the lowest gross* minimum wage (€261) across the EU. Nine Member States, all also located in the east of the EU, followed with minimum wages between €400 and around €500 per month: Lithuania (€400), Romania (€408), Latvia (€430), Hungary (€445), Croatia (€462), the Czech Republic (€478), Slovakia (€480), Estonia (€500) and Poland (€503). 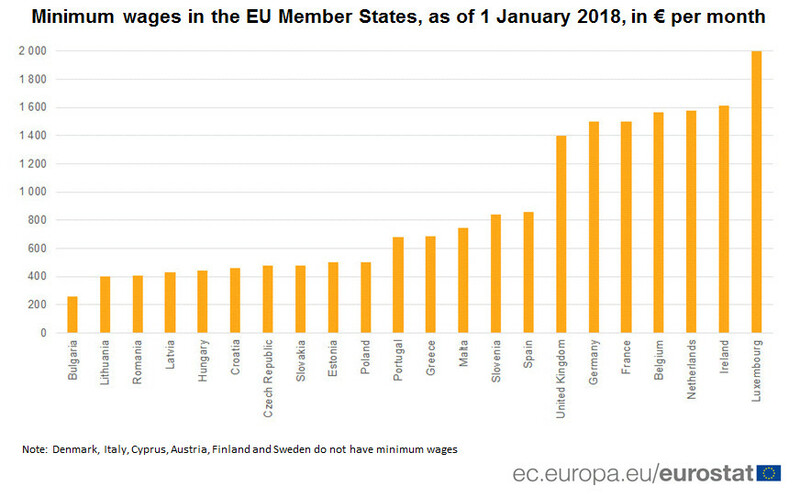 In five other Member States, located in the south of the EU, minimum wages ranged between €600 and €900 per month: Portugal (€677), Greece (€684), Malta (€748), Slovenia (€843) and Spain (€859). In the remaining seven Member States, all located in the west and north of the EU, minimum wages were above €1 400 per month: the United Kingdom (€1 401), Germany and France (both €1 498), Belgium (€1 563), the Netherlands (€1 578), Ireland (€1 614) and Luxembourg (€1 999). For comparison, the federal minimum wage in the United States was €1 048 per month in January 2018. Across the 22 Member States concerned, the highest minimum wage in the EU was almost 8 times higher than the lowest. However, the disparities in minimum wages across the EU Member States are considerably smaller once price level differences are eliminated: minimum wages in Member States with lower price levels become relatively higher when expressed in purchasing power standard (PPS), and relatively lower in Member States with higher price levels. By eliminating price differences, minimum wages ranged from 546 PPS per month in Bulgaria to 1 597 PPS in Luxembourg, meaning that the highest minimum wage was almost 3 times higher than the lowest.